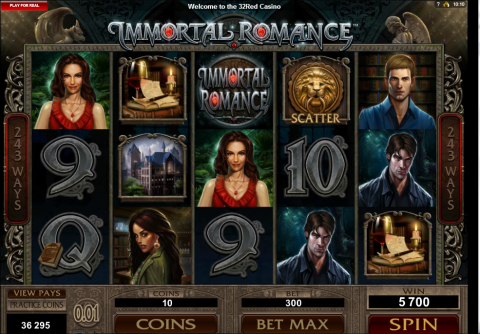 The Immortal Romance slot is a new generation 243-way MicroGaming video slot title based around vampires and romance, much like Twilight films or the True Blood TV series. The game is based around four characters – Amber, Troy, Michael and Sarah and all of these have their own story to tell. This slot has a sumptuous gothic feel about it and offers many features as part of the ongoing storyline. In this review I delve into all aspects of the Immortal Romance Slot. First up, I explain the basics of the game as well pointing you to the most valuable symbols. I then move onto look at the bonus features. The review ends with a summary of this impressive slot and an online casino where I can recommend you playing the game. Behind the love affairs, the blood sucking and the gothic setting, this is something of a standard 5 reel slot – however there is one key difference to some other slots. Here you have 243 win lines. This means all sequences from left to right on adjacent reels are wins, you'll hit more often than on the 25 or 30 win-line games, which keeps your bankroll ticking over nicely. You can set the coin amount (from 1c up) and the number of coins per line (up to 10), which gives you plenty of control over your bet amounts even without the ability to change the number of win lines. The best standard symbol in the game is the ‘Immortal Romance’ one, which is worth 15,000 coins if hitting five – this symbol also acts as a wild symbol and any wins achieved using this will also be doubled. The four characters in the story are the next most valuable symbols, followed by the ‘Gothic Castle’ and the ‘Manuscripts’. The other standard symbols are 9, 10, J, Q, K and A. On occasions the ‘Wild Desire’ feature appears randomly, which will turn an entire reel into wild symbols – you’ll sometimes find that more than one reel (up to all five) can turn wild. The final symbol in the game is the golden lion door knocker – hitting 5 of these is worth 60,000 coins. However, perhaps more importantly, this is also the scatter symbol, and three or more of these enables you to enter the ‘Chamber of Spins’ bonus round. Having activated the bonus round, you’ll move through each character in the story. You’ll start with Amber before moving onto Troy when you’ve activated the feature for the fifth time. The 10th trigger will introduce Michael and you’ll finally meet Sarah after the 15th trigger. Each character will offer a differt bonus round. For example, Amber will give you 10 free spins, with every win multiplied by five and Sarah will give you 25 free spins with a ‘wild vine’ feature on reel 3, which transforms the reel into wilds. Troy and Michael offer 15 and 20 free spins respectively, with additional features. If you have ever played the hugely popular MicroGaming title ThunderStruck 2 then you will recognise that the chamber of spins is the same concept as the 'Great Hall of Spins'. Both have progressive features and both can result in some huge wins. This is a positive in my opinion - if you have a great idea, why not re-use it. You can find both of these excellent games (and 100's more) at the award winning UK-Licensed 32Red Casino. Graphically, the game is superb and does a great job of keeping to the gothic feel of the game – the background sound aiding in this respect. When entering the ‘Chamber of Spins’ bonus feature, a relevant catchy song plays, which once again adds to the game. You can choose whether or not to really become involved in the story by checking out the characters bio’s in the ‘help’ section of the game, although you can gain more of an idea about these characters when hitting five of the symbols, where a video animation will introduce a ‘sometimes gory’ aspect of their character. Fans of the Vampire genre will take to the game, but as someone who isn’t particularly a fan, I enjoyed the game and would definitely consider playing again – as even when you strip away the theme of the game, you have an enjoyable slot with a good variety of bonus features. This slot is part of the range of games on the MicroGaming 'Viper' platform. These are compatible with mobile devices via a responsive in-browser platform. Recent technology changes have made these games just as good as the full download versions. Try them out on your smartphones or tablets and you'll see what I mean. You can enjoy Immortal Romance at the 32 Red online casino. This award winning site plays host to a great number of online games, where you’ll be able to enjoy such favourites as Roulette, Blackjack, Video Poker as well as the incredible range of other likewise impressive slots. When joining this casino, you’ll be able to enjoy a £10 no deposit bonus, where you’ll play for real money without depositing or needing to register your credit card details. You’ll also be able to earn £32 for every £10 you deposit in bonuses if you like what you find. Check out www.32red.com and try Immortal Romance for yourself now!